Salvation And Survival: I Warned You! There are times that things I see seem so clear and transparent, yet I have doubts that anyone ever reads what I write, or if they do, it is too difficult to take seriously. Yet I know that I am not the only one who has been sounding the alarm. Others have written of the covert efforts of the Muslim Brotherhood to infiltrate our country -- from the highest echelons of government, to our corporate board rooms, and our children's classrooms. In June, 2013 I wrote a detailed blog post about the clandestine endeavors surrounding the Brotherhood's endeavors to wage "a kind of grand jihad in eliminating and destroying the Western civilization from within." The idea of a Global Caliphate was new and, frankly, most people in the West sneered at the notion. Now, nearly two-and-a-half years later, we are focused on the beheadings and exterminations of Christians in the Middle East; the exponential growth in rapes of European women by Muslim immigrants; and the growing threat of terrorist plots on our own soil. But while we are zeroing in on these atrocities, there has been a more subtle jihad being committed in the heartland. In 2013, I warned you about the Cosmos Foundation, a charter school operator founded a decade ago by a group of professors and businessmen from Turkey. The group, currently using the name Harmony Schools, has become the biggest charter operation in the state of Texas, promising American parents that they could increase their children's comprehension in math and the sciences. What concerned me was the fact that the Cosmos Foundation had also forged ongoing relationships with a close-knit network of businesses and organizations run by Turkish immigrants. Some of those founders, as well as school operators, and many of their business suppliers, were followers of a man named Fethullah Gülen. Since I wrote that article, it has become apparent that Turkey has regressed from a secular democracy into an Islamic state, and Imam Fethullah Gülen and his Gülen Movement (GM) had an enormous influence in setting the increasingly Islamist agenda in Turkey. In fact, in Turkey, 75 % of the nation’s two million preparatory school students are enrolled in Gülen institutions. In America, GM runs the largest charter school network in the nation. In 2013, I asked the following question: When you connect the dots, don't you think all this information is worthy of our scrutiny and our concern? And in light of the connections between GM and the political campaign of a certain candidate for the President of the United States, I still stand by that astute question. And apparently, so does Ariel Cohen, a writer for The Blaze. 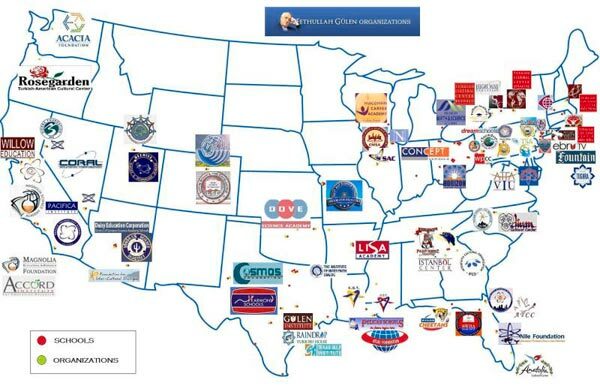 Mr. Cohen has written an excellent article, in which he points out that the myriad of organizations affiliated with the Gülen movement include banks, newspapers, universities, charities, research institutes, and the largest network of private Muslim schools in the world. The school curriculum is not "overtly" Islamist, and claims to focus on science, technology, engineering and math (also known as STEM). Cohen alleges that the Gülen-affiliated net business worth exceeds $25 billion, and together, they receive approximately $150 million a year in U.S. tax breaks and subsidies -- all leading to an unhealthy mix of politics, education, and religion that is infecting our nation. Mr. Cohen is so bold as to suggest that the Gülen organization "appears to be busy buying, using and abusing political power.... The web reaches up to the corridors of the U.S. Congress and down to local schools from Texas to Tahoe. According to a USA TODAY investigation, over 200 trips for congressmen and congressional staff have been sponsored by Gülenist entities". And here is something that should concern us all ... According to the Clinton Foundation website, Recep Ozkan, former president of the Gülen-connected Turkish Cultural Center, contributed between $500,000 and $1 million. Unsurprisingly, former President Bill Clinton has appeared at Gülen movement events and praised the founder’s contributions to world peace and inter-religious understanding. But these "Turkish operatives" are not tied to just one party. Both Democratic Representative Henry Cuellar of Texas, and Republican Senator Kelly Ayotte have been reported to be recipients of Gülen organizational donations (although Senator Ayotte returned funds, once she discovered their origin). Currently, the FBI is engaged in a massive probe of Gülenist activities in this country. However, the investigation is limited to the Gülen-linked schools. But there is some hope ... It is the task of law enforcement to protect our politics, our country, and most importantly our children, from illicit external influences. Therefore, as the FBI investigates the network, it can also look into the political donations by the members of the movement. I hope they do so. It is apparent in his home country of Turkey that Imam Gülen has an agenda ... to infiltrate all the business centers, re-educate the children, and obtain State power, and a warrant for his arrest has been issued. Does it not seem plausible that he and his followers are trying to institute the same paradigm here in the U.S.? We need to pray that the FBI will be allowed to conduct a thorough investigate; that Congress will weed out this invasive and subversive enemy of American sovereignty; and that God will shine His light upon the organization's false motives. I know we have ignored this enemy for far too long, but I have faith that God can destroy their plans. Job 5:12-13 "He frustrates the devices of the crafty, so that their hands cannot perform their enterprise or anything of [lasting] worth. He catches the [so-called] wise in their own trickiness, and the counsel of the schemers is brought to a quick end." I do read your blog posts everyday. I do feel like you are right on the money. I often have to stop myself from thinking about it all too much. It can drive one crazy and we do know the end of the story. That said, it is so frustrating to think that this once great Christian nation has allowed the whittling away of our Christian values and a whole new mindset is already amongst so many youth. I believe it will take a movement among the youth of our country to change the course and of course God. I think the older generations of which I am a member have just more or less thrown in the towel. To think that an blatant socialist would have a voice that he does in our country is enough to send me over the edge. We are no different from the Israelites who one generation served God and the next turned their backs on them until the troubles were so unbearable that they had no choice but to turn to God. I really hate to think what we will have to face here. The one thing I have decided is that I can only do what is right in front of me. That is sound the alarm to my friends and family. Pray like crazy for them. Vote and pray for my country. I am one voice, but that is what I can do. I can't learn enough of God's Word or spend enough time with Him. Keep writing - you are heard, but many like me don't quite know what to do with the message. The one thing that I want you to take away from my blog is that you are not alone... Like so many in the world (because Americans are not the only ones who visit this site) I'm pretty sure that you have felt for quite some time that things have not been right, and that evil has been encroaching upon our lives. It is hard to face that fact, and we all have to decide ... are we going to face it, or are we going to stick our heads in the sand or hide our eyes? I decided that, with faith in God, I would stand and face the Enemy. That I would pull the curtain aside and reveal the schemes and lies that have lulled us into a false sense of security... and hopefully wake people up to take charge of their lives. As to what to do with these unsettling messages... I would like you to understand that there is no political answer for our troubles. We are a nation under judgment, and we are reaping what we have sown. That being said, we have not been given a spirit of fear, and we are to be bold in our profession of faith, point people to our Savior, seek God's wisdom and a discerning spirit. Do your own research on what is going on in the world and then keep sounding the alarm to your friends and family. Keep praying. Yes, you are just one voice, but your voice combined with all the other single voices are being heard in Heaven. Do not turn away from world events, but always stay focused on God's purpose for your life -- owe were born for such a time as this, and let Him use you to glorify Him!